Samsung may finally get some good news in regards to the lengthy legal proceedings the company has been party to alongside Apple in a patent battle that's extending well beyond a jury's August decision. A United States Court of Appeals for the Federal Circuit on Friday granted U.S. District judge Lucy Koh the power to rule on a sales ban she imposed on Samsung's Galaxy Tab 10.1. That means it's now up to her to decide whether the tab can go back on sale in the U.S., a ban that went into effect at the onset of the trial. Koh, who presided over the four-week courtroom tussle between the two tech giants, previously ruled she wouldn't lift the sales injunction on the slate, saying it fell out of her jurisdiction as the matter had gone to the federal appeals level. With Friday's ruling, the ball's back in her court. 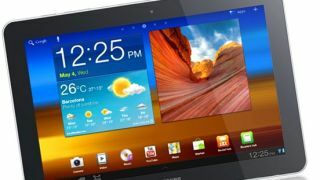 Even though Samsung lost the case to the tune of $1.05 billion (UK £665 million, AU $1.03 billion), the jury found the Galaxy Tab 10.1 didn't infringe on any patents, prompting Samsung to challenge Koh's pre-trial ban. Now that Koh has been granted the power to lift the sales ban, experts believe she'll do just that, bringing the Galaxy Tab 10.1 back on the U.S. market soon. Despite this new potential positive for Samsung, the company isn't quite done with Apple yet. On Tuesday, Samsung asked for a new trial against Apple, with claims "no reasonable jury" would have sided with Apple's infringement claims. For its part, Apple is also bringing another lawsuit against Samsung, claiming the South Korean company damaged the iPhone brand, and hoping to gain another $707 million (around UK £435, AU $676) from its chief rival. Both companies are set to appear before Koh again on Dec. 6 to discuss more post-trial motions, such as other possible bans on Samsung products found to be in violation of Apple's patents. TechRadar reached out to Samsung, and will update this story if and when the company responds to a request for comment.